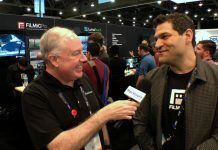 On the show floor at NAB 2013 in Las Vegas, Zach Barbitta, the Director of U.S. Operations for Pivothead, shows us how to record anything you do, and the world around you, just by putting on their Pivothead glasses. With a camera mounted in the bridge of the glasses, you can capture 1080p movies or take still photos without anyone ever knowing. 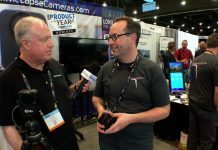 Zach talks about the surprising quality the glasses deliver, their memory and battery capacity, and more.